WHAT HAPPENED: Syracuse (12-2, 1-0) finished off 2017 with an eye-opening 2-3 zone defensive performance in knocking off the high octane Hokies (11-3, 0-1). SU’s big three offensively, Tyus Battle, Frank Howard, and Oshae Brissett combined for 53 points. ANALYSIS: Virginia Tech came into the conference opener averaging a whopping 91 points per game, but was completely shut down by the consistently active Syracuse zone, scoring just 19 first half points as SU set the tone. The taller Orange harassed the Tech shooters all night, the Hokies finished shooting 34% from the field. Jim Boeheim played just six players, but all contributed in their roles from scoring, (49% shooting from the field), playing a hawking defense, and hustling for loose balls while controlling the pace of the game. HERO: It’s hard to single out one player in this team effort to shut down a high scoring team, so all six ‘Cuse players who saw action fit in the “hero” category for this game, certainly highlighted statistically by both Brissett’s game high (tied) 19 points along with nine rebounds and a blocked shot, and Matthew Moyer’s career-high 13 rebounds while chipping in with 11 points. 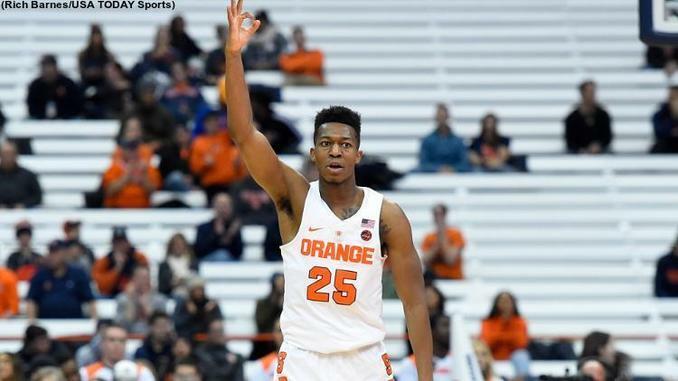 ZERO: It’s picky with a big team victory, but coming off a career-high 15 points against Eastern Michigan last Wednesday, Paschal Chukwu struggled offensively against a smaller Tech lineup with zero points, but he did chip in with five rebounds and four blocked shots. WHAT’S NEXT: Syracuse goes on the road for the first time in ACC play visiting Wake Forest (7-6, 0-1) on Wednesday, Jan. 3 at Joel Coliseum in Winston-Salem, N.C. This is the first of two games in the regular season against the Demon Deacons. Wake played North Carolina tough in its first league game Saturday falling at Chapel Hill 73-69. Game Time: 7:00 p.m. ET/TV: ESPNU.